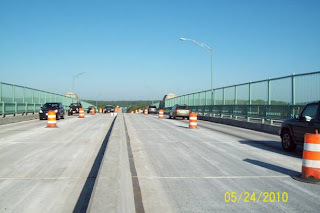 Even though the hot days of summer are here and traffic is flowing across all lanes on the A. Piatt Andrew Bridge carrying Route 128 over the Annisquam River, work on the reconstruction of the bridge is continuing at a steady pace. I am pleased to provide you with an update detailing current activities and progress on the project, and some photos of the project. Particularly noteworthy in the MassDOT's report is the information relative to the construction schedule continuing to include Saturdays and Sundays. Please click “Read more” to review the Massachusetts Department of Transportation’s most recent update. Newly completed bridge deck and median barrier shortly before all travel lanes were reopened. Ongoing substructure repairs at the base of existing piers. 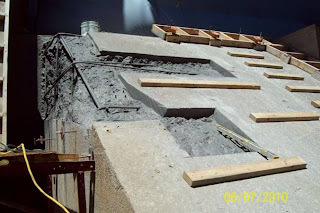 Description The work involves the removal and replacement of the wearing surface of the bridge deck along with rehabilitation of the superstructure and portions of the substructure on Bridge No. G-05-017 carrying Route 128 over the Annisquam River in Gloucester. The project also included replacement of the sidewalks along with significant structural repairs and painting portions of the superstructure. A new wearing surface has been placed on the bridge along with a new median barrier. The existing bridge railing was refurbished and a suicide deterrent safety screen erected along the sidewalk. SPS New England, Inc. is completing the work. Current Project Status – All travel lanes were reopened to traffic during the last week in May, prior to the Memorial Day weekend. Prior to reopening all of the lanes, the new concrete deck overlay was sealed and diamond ground to a smooth riding profile with transverse grooves added to ensure a safe ride. New thermoplastic pavement markings were also installed. There will be continuing temporary lane closures on weekdays to facilitate ongoing work on the underside of the structure. The Contractor is currently working on masonry repairs/rehabilitation and structural steel repairs below the bridge. The Contractor is also cleaning and painting the structural steel. The Contractor will continue to work Saturdays and Sundays, as needed, as well as extended hours during the week to remain within the approved schedule of operations.